Sometimes what’s neatly lined up in your head just doesn’t quite match reality. 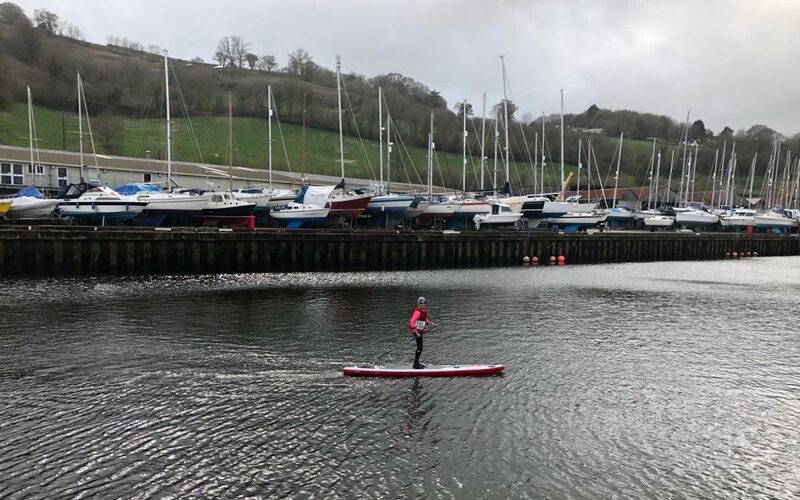 And so it was with my first proper standup paddleboard race, the Head of the Dart, on Sunday 15 April. We’d all been looking nervously at the weather forecast and doing that thing where you circle from app to app hoping that the next one will yield something other than rain and strong winds. Then early on Saturday came the announcement from race HQ: the forecast was grim and the route had to change. Instead of a one-way, tide-assisted upstream run from Dartmouth to Totnes, we’d now be doing a shorter out-and-back route out of Totnes. So on the plus side, none of the gear and vehicles logistics juggling that comes with a start and finish in different places. But against that stood the prospect of paddling downstream against the tide and into the wind for around 5.5k before turning and coming back. Wait though, you’re thinking, that means you’d be coming back with the wind behind you and the tide in your favour. Yup. That was the theory. If you recall, I was — along with my Bray Lake newbie training mates — nudged into taking part in a competitive race rather than as part of the leisure fleet. Now, as we stood together at the Sunday morning race briefing surrounded by seasoned campaigners and with the rain lashing the windows of Totnes Rowing Club, we were ever so slightly questioning our choice. But we were all present and correct on the start line and all committed to giving this our best shot. And this was where I embarked on another stage of this rollercoaster of a SUP learning curve. I always get an adrenaline build-up when I’m lined up to go in a race, and so it was in Totnes. 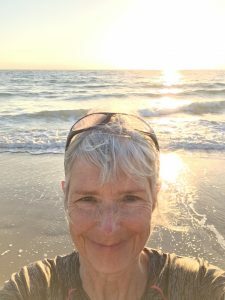 But as I set off accompanied by that over-stretched, shaky, tummy butterflies feeling that goes with the territory, I wasn’t bothered: with running and swimming, it quickly subsides as I hit race pace and is gone altogether within 10 minutes. Plus I hadn’t noticed it being an issue at the races I’d done at Bray. Not this time, though: it stayed with me, doggedly tracking my every move from start to finish. I tried all manner of mind games to switch off the adrenaline flow, but nothing worked. The result? I felt I was engaged in a double battle — first with the conditions and second with my stubborn body which was declining to play nicely. The combo meant I struggled on all fronts, and what was already a challenging race became something of a fight for survival. Downstream was indeed tough: wind, squally showers, lots of chop, and paddling against the tide. At times I felt like I was going backwards, and didn’t dare stop in case I actually did! But I made it to the halfway buoy, wrestled my way around that in the middle of a squall, and then allowed myself to relax a little as it should all be a comparative doddle now with space to properly enjoy the stunning views. The wind had swung round and for a large chunk of the return leg it was in our faces again, something only partly mitigated by the accommodating tide. This was, to put it politely, a disappointment. But I kept going, adrenaline OD and all, and got to the finish in just under two hours — significantly slower than most. Then, of course, I began beating myself up — I was right near the back in our race class — and for a while failed to take any positives from the experience other than completing the course and not falling in. Now, though, I can see that I actually did pretty OK. The day didn’t play anything like I imagined it would, and was much more of a physical challenge than I’d anticipated. And the fact is I do sometimes forget that I’m not 35 any more and while a few other women around my age finished ahead of me, I know a lot of that is to do with technique and I still have a long, long way to go before I crack the code of what makes for their fast, efficient, paddling. My biggest takeaway? I need to explore why I could not disarm the adrenaline flow. Was it because when I run and swim I’m moving with all my body, making it easier to dissipate, while with SUP my legs are pretty much rooted to the board? Or was it mostly in my head? Or both? I don’t have an answer yet and am hoping that I find it before my next challenge on 28 April: the Battle of the Thames which, while longer than Head of the Dart and a tough multi-lap course, should — I truly hope — at least be slightly less meteorologically challenging. Plus this one takes place on my birthday, so I clearly have to finish with a big smile on my face! Meanwhile, my apologies to everyone I whinged at post-race and my thanks to everyone in Team Bray: you’re all stars and there’s no way I’d have got this far without you. Main image shows me just after I’d finished in Totnes — I was near the back of the field, which is why I’m on my own! Wow!! A massive Well Done!! Doesn’t matter a jot where you finished, you completed a mammoth challenge. You should be so proud of yourself, so many people (& no you’re not 35 anymore!) wouldn’t be able to even attempt what you did. Very impressive!! Thank you, Sam — yes, I do sometimes need to keep slightly more perspective!